"Pushkin was right. There cannot be a happy end. There cannot be!" When making a biopic, a director often must walk a tightrope between bare facts and plain fantasy, as well as between idolizing the topic and tearing him down. Tchaikovsky, as one of the most notably tormented souls of the 19th century, is an intriguing subject for a biographical film, but director Igor Talankin gives the music of Tchaikovsky center stage here, offset against select moments from Tchaikovsky's life. Talankin does not even attempt a straight biography. Rather, the film is presented in the form of vignettes. After a brief scene of Tchaikovsky's childhood, emphasizing his love for the piano and attachment to his mother (who died when Pyotr was 14), we skip ahead to the adult Tchaikovksy (Innokenti Smoktunovsky) after a bizarre sequence with his servant, Alyosha (Yevgeni Leonov). The uneasy friendship with Nikolai Rubinstein (Vladislav Strzhelchik) is established. Pyotr then, for reasons impossible to discern from the film, marries a brainless young woman from the conservatory with predictably disastrous results. The balance of the film centers on the peculiar relationship between Tchaikovsky and his patron, Natalia von Meck (Antonina Shuranova). Over thirteen years, they exchanged letters and she essentially supported him, yet he refused to even meet her. This much I know is true, but the film sets this up as a ploy by the jealous musician Pahulsky to keep von Meck away from him. I have no idea whether this angle of the story is true, but it does lend the picture what little drama is present. Tchaikovsky is portrayed as inexplicably depressed and miserable throughout, except when he thinks about the music he has yet to compose. Perhaps Russian audiences already know the life story of Tchaikovsky quite well, but anyone not familiar with him as a man is likely to be quite at sea here. Characters appear, are never properly introduced, so that we have no idea who they are or what relationship they have to anyone else, and then they vanish. This certainly leads to a rather confused viewing experience, at least the first time through. As noted already, the emphasis here is really on the music. This is artfully used, though since Russians think of Tchaikovsky as an operatic rather than a symphonic composer, his operas get much of the attention. But there is still plenty of suitably dramatic and moving music to propel matters along, even if the viewer has only the vaguest conception as to who the people on the screen are. The one rather hackneyed moment is a thunderstorm metamorphosing into a symphonic movement. Although Tchaikovsky was reputedly a warm and forthcoming individual, Smoktunovksy portrays him as incredibly stiff (though in watching the featurettes, I suspect that he may simply be trying desperately to keep from losing his toupee and fake spade beard). The supporting characters are more convincing, notably Shuranova, who renders the difficult part of von Meck believably, torn between appreciation for art and an unrequited long-term crush on the man she never even meets. Vladislav Strzhelchik is quite good as Rubinstein, but the real gem of the piece is the servant Alyosha (comedian Yevgeni Leonov), who is both hapless and eternally faithful to the composer. The scene of Alyosha attempting to relate the story of Eugene Onegin to the composer is a little gem that's one of the outstanding moments of the picture. Oddly enough, the film completely sidesteps the issue of the composer's homosexuality. This omission makes many of his actions completely incomprehensible here (though they are difficult enough to fathom even knowing the situation). Likewise, Tchaikovsky's death is glossed over without any conjectures at all as to whether there is any truth to the story of his suicide by drinking cholera-infected water, or the rumors of a politically-motivated suicide. Instead, there is simply an intertitle that states without elaboration that he died eight days after the concert that is the climax, such as it is, of the picture. Again, those unfamiliar with Tchaikovsky's life and death are likely to be completely lost here. Tchaikovsky does not have a solid narrative thread to carry it; rather, it is best thought of as an Impressionist interpretation of the composer's life. There's plenty of excellent music, however (the more saccharine compositions are thankfully kept well in the background). There are moments that are absolutely magical: one of these is the carriage running through a forest of birch trees, on a carpet of orange leaves. The visual of this brief sequence is utterly jolting, even though it's just a carriage ride. Similarly, there is a bold 360-degree shot of all the parties at a table laughing at Tchaikovsky as he tries unsuccessfully to silence his idiot wife. This moment, like no other in the picture, makes one feel truly close to the composer. These are just a few of the truly stunning moments to be found here. The running time is about six minutes shorter than indicated on the keepcase. Image Transfer Review: The anamorphic widescreen presentation is described as 2.35:1, but looks more like about 2.1:1 to me. The video is plagued by nearly incessant flicker that is worse in exterior shots, but present even in most of the interiors. The picture is rather soft, and although the reds are strong the other colors have a pale and washed out appearance. The black levels are passable. There are speckles and dirt on the picture throughout, and significant aliasing is present. At times, including many of the closeups, the picture looks quite digital. Audio Transfer Review: The three 5.1 soundtracks on this disc make an excellent argument for leaving older movies in their original mono (which is not included here). The sound is split up among the channels in a highly unnatural way, and dialogue has a terribly echo-y quality. It appears that Russian sound film didn't progress much in the 30 years since the abominable audio of Alexander Nevsky. There is excessive noise and hiss throughout the Russian track, and the music sounds very tinny and distorted, as if it were being played off of 78s. Much of the music is sent to the surrounds and is at such high levels that it often drowns out the dialogue. The dialogue itself sounds rather muffled, exacerbating the problem. The soundstage sounds very artificially spread out, shifting abruptly from speaker to speaker. The only place where the 5.1 mix is effective is during the sleigh ride, where one gets a proper feeling of being in the moment. The stems are split up so many different ways that the whole thing ends up sounding very thin and anemic. The English dub sounds much better since it is, at least, not plagued by the noise that is in the Russian, but this is hardly a satisfactory way to watch a Russian film. Extras Review: Although there is a goodly amount of extra material here, the presentation of the discs is highly irritating, so let me get this off my chest. Why are there copyright and distribution warnings in three languages? Why are they completely unskippable? Why are they on BOTH discs, interrupting the viewing of parts 1 and 2? For that matter, why is the film not on one disc and the extras on a second, rather than spreading the movie and the extras over both? Why can the soundtracks not be changed on the fly? Why can the subtitles not be changed on the fly? Instead, one must go back to the cumbersome menu. Why are the layer changes placed so as to be as disruptive as possible? On disc 1, the layer change, which is lengthy even on my usually speedy Sony, is right in the middle of the bold fanfare that opens the Fourth Symphony! If Tchaikovsky weren't already dead, this would certainly kill him. I've never seen such a haphazard and unfriendly set of discs, especially from Kino, which usually does just fine on these matters. Okay, I feel better. On the good side, there are four featurettes. One centers on Tchaikovsky's boyhood home and the home of his old age. Another is a 5m:34s interview with Smoktunovsky that is less than enlightening about his interpretation. He does, however, state that the script is not good! Maya Plisetskaya, who dances in the film, has a 10m30s presentation about the role of music in ballet, illustrated with moments from Swan Lake. This to me was the most informative of the extras. The final extra is a three-minute discussion with cinematographer Margarita Pilikhina. A raft of filmographies for most of the cast and crew is included, as well as a 2-screen bio on Talankin. The trailers are all hidden within the filmographies (denoted as 'announcements'). They make me yearn for War and Peace to be issued on DVD, as well as the 1964 Russian Hamlet with a score by Shostakovitch. There is also a short, written bio of the composer. Wrapping up the package are 11 color stills and 9 black & white production photos. 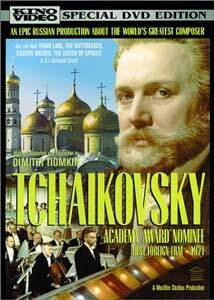 An arty and interesting take on the composer Tchaikovsky, developed with emphasis on his music rather than the bare facts of his life. While the extras abound, the presentation is sadly very poor, with marginal audio and video (though these latter may not be Kino's fault).